Reedmere01282 845284work Self-cateringThis modern spacious cottage enjoys a perfect waterfront location with its own private mooring, situated on a marina just off the main River Bure. The picturesque village of Horning is just a short stroll away, with its shops, tea rooms, inns and restaurants. Within a few minutes walk is the Marina Leisure Centre, (daily charges apply), with indoor heated swimming pool (30ft x 14ft), spa bath, sauna, solarium, fitness suite and coffee shop. Wroxham, the bustling capital of the Norfolk Broads, is just a short drive and has many shops, cafes, restaurants and a train station. 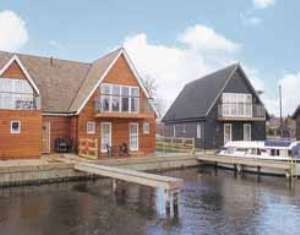 The cottage is superbly situated for exploring the Norfolk Broads. Hire a boat locally, and take a leisurely cruise down the River Bure to enjoy the sights and sounds of the abundance of wildlife that reflect the natural beauty of these famous waterways. Enjoy a ride on the Bure Valley Steam Railway, running from Wroxham to Aylsham. Nearby National Trust run Blickling Hall, a 17th century mansion, is set in lovely gardens and is a host to music festivals. Golf at Sprowston Manor, 8 miles. The city of Norwich is 12 miles away, for excellent shopping, cathedral, castle, museum, restaurants, cafes, theatre, indoor bowling alleys and cinema complexes. Within 30 minutes drive is the coastline, with miles of sandy beaches to explore. For those who want to relax and take it easy, sit back and enjoy a refreshing drink on the balcony whilst admiring the view. Pub within a few minutes stroll. Ground floor: 3 bedrooms - 2 double, both with en-suite bathroom, one with shower cubicle, toilet & basin, one with shower over bath, toilet & basin, 1 twin, bathroom with bath, shower attachment, toilet & basin. First floor: Spacious lounge with French doors to balcony & marina views/dining area, kitchen. Services: GFCH. All gas, power & bed linen (duvets) inc. Towel hire. Parking for 2 cars. DVD player. Radio/CD player. Elec hob & oven. D/washer. F/freezer. M/wave. Washer/dryer. Decked veranda with furniture. Balcony. Unfenced river 5 yards, young children must be supervised. Family parties only. Non smokers only. This modern spacious cottage enjoys a perfect waterfront location with its own private mooring, situated on a marina just off the main River Bure. The picturesque village of Horning is just a short stroll away, with its shops, tea rooms, inns and restaurants. Within a few minutes walk is the Marina Leisure Centre, (daily charges apply), with indoor heated swimming pool (30ft x 14ft), spa bath, sauna, solarium, fitness suite and coffee shop. Wroxham, the bustling capital of the Norfolk Broads, is just a short drive and has many shops, cafes, restaurants and a train station. The cottage is superbly situated for exploring the Norfolk Broads. Hire a boat locally, and take a leisurely cruise down the River Bure to enjoy the sights and sounds of the abundance of wildlife that reflect the natural beauty of these famous waterways. Enjoy a ride on the Bure Valley Steam Railway, running from Wroxham to Aylsham. Nearby National Trust run Blickling Hall, a 17th century mansion, is set in lovely gardens and is a host to music festivals. Golf at Sprowston Manor, 8 miles. The city of Norwich is 12 miles away, for excellent shopping, cathedral, castle, museum, restaurants, cafes, theatre, indoor bowling alleys and cinema complexes. Within 30 minutes drive is the coastline, with miles of sandy beaches to explore. For those who want to relax and take it easy, sit back and enjoy a refreshing drink on the balcony whilst admiring the view. Pub within a few minutes stroll. Ground floor: 3 bedrooms - 2 double, both with en-suite bathroom, one with shower cubicle, toilet & basin, one with shower over bath, toilet & basin, 1 twin, bathroom with bath, shower attachment, toilet & basin. First floor: Spacious lounge with French doors to balcony & marina views/dining area, kitchen. Services: GFCH. All gas, power & bed linen (duvets) inc. Towel hire. Parking for 2 cars. DVD player. Radio/CD player. Elec hob & oven. D/washer. F/freezer. M/wave. Washer/dryer. Decked veranda with furniture. Balcony. Unfenced river 5 yards, young children must be supervised. Family parties only. Non smokers only.